During the first time I set foot in Malaysia back in 2010, we only had one day and between Melaka, Genting Highlands and the Batu Caves, we decided to play with the clouds. It was only during the month-long Southeast Asia backpacking trip that I made it to Melaka and to the Batu Caves, both thanks to my fried Rajie who took time off her busy schedule to tour me, Lalai and Tetet! 🙂 Anyway, Batu Caves, as the name suggests (in Tagalog, batu, well bato, means stone), is a series of caves and cave temples inside a limestone hill. 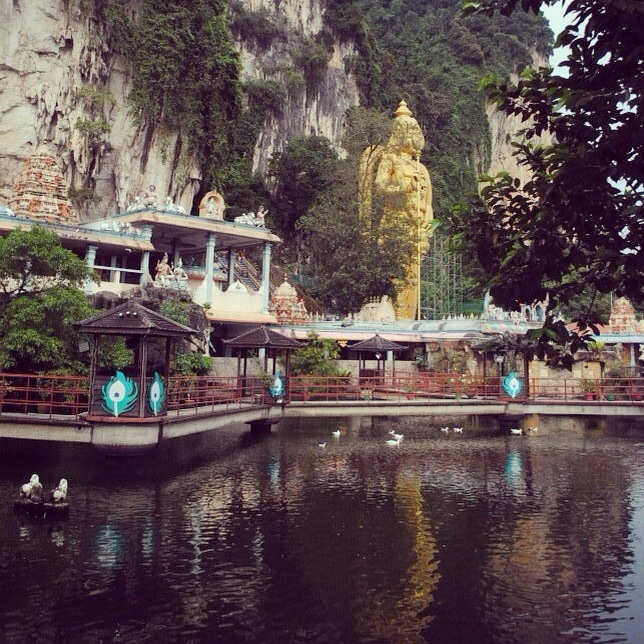 Batu Caves is a popular tourist spot and Hindu temple site around 13kms north of Kuala Lumpur, the capital city of Malaysia. The area is surrounded by birds feeding on corn kernels the visitors throw around and by a small pond of ducks and koi fish. You’d need to climb up about 8-10 floors worth of stairs, alongside monkeys that can be pretty violent when they see food, to get inside the caves and the temples. Rajie, at the time at least, was not a devout Hindu so we were not sure whether the stories of Kartikeya (the massive golden statue at the foot of the caves to which the cave temples are dedicated to), and his family (daddy = Shiva, mommy = Parvati, brother = Ganapathi) and the peacock he’s riding, were as accurate as the scripts or just made up bedtime stories! It was quite entertaining though. 🙂 After visiting the caves, you might want to relax your legs and knees a bit and stay a while by the small pond, watching the ducks and koi fish glide and swim. Or, you can also pay a visit to Lord Hanuman, the monkey god, farther on the left. Previous PostDiwali: the Festival of Lights (Singapore and India)Next PostReblogged: The Taj Mahal – Finally!